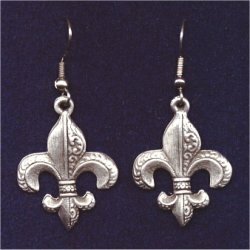 The Fleur de lis is a stylized lily or iris. It is seen in the French Royal Arms and in English Royal Arms up to 1801. The Fleur de lis is the symbol of Purity and light. Each earring measures .75" x 1" and comes on surgical steel ear wires.